Progression is a process by which something advances in increments or stages, where a new stage is often judged by its evolution or blatant divergence from the previous stage. As listeners, we tend to champion slow progression rather than abrupt transformation, however, if the subsequent step too closely resembles its predecessor, we become critical and comment that movement isn’t happening fast enough. For Yellow Ostrich, progression continues to move the Brooklyn-based band away from its quirky vocal looped melodies as seen on The Mistress and further into the realm of indie rock mainstay with band’s latest release Cosmos. Single and lead track “Any Wonder” sets the tone with its deliberate guitar driven and slightly repetitious melody anchoring Alex Schaaf‘s soaring vocals – the most confident we’ve heard him bellow since taking hold of the mic as Yellow Ostrich. Cosmos carries with it a sense of wonderment and isolation as one can get lost in the vastness of time and space on “My Moons.” The organic feel of Yellow Ostrich is still very much present throughout the album – the instrumentation builds upon itself in a very natural way – on “Neon Fists” percussion brings in Schaaf’s rhythmically stylized vocals, with baseline layers added, then delicately plucked guitar riffs, all building repetitiously, then abruptly ceasing. 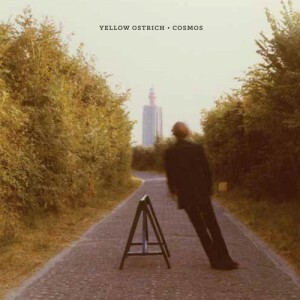 Cosmos is the most “mainstream” album in the Yellow Ostrich catalog and will undoubtedly have mass appeal among new listeners. But the more interesting question is whether die hard fans will embrace Yellow Ostrich’s progression, or what may be perceived as experimental digression, on Cosmos with open arms.